Why do women seem to be deserting computer science education? 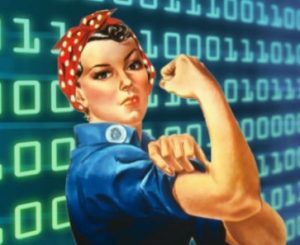 A new study by Accenture and Girls Who Code (GWC) exposes the unpleasant fact that the percentage of women in U.S. computer science programs has plummeted from 37% in 1984 to just 18% today. That, along with a finding that the gap in pay between men and women in tech is actually growing, has prompted lots of finger-pointing, and a whole lot of ideas on how more women can be encouraged to get into computer science. Accenture CEO Julie Sweet recommends that schools hire more female computer science teachers at the high school level. Though boys don’t seem to care much about the gender of their teachers, girls seem to see the subject as more “cool” if it’s taught by a female instructor. Changing the curriculum to be more girl-friendly is another recommendation. To many applications being built in computer classes focus on games or sports, which are of far less interest to girls than boys. One California school, Harvey Mudd College, has actually been able to boost its percentage of women computer science majors by simply changing the name of its courses from “Introduction to Java Programming” to “Creative Problem Solving In Science And Engineering With Python,” and by using course examples that focus on world health instead of gaming. High schools need to stop killing girls’ interest in technology. Right now, 74% of American girls in middle school express interest in STEM subjects, but by the end of high school, just 0.4% are focused on getting a college degree in computer science. Schools need to do a better job of changing a perception that math and science are masculine fields, by creating more opportunities that keep young women engaged in tech learning. While out and out discrimination may be minimal, many women in tech report an undercurrent of condescension and isolation that companies have not been quick to address. A male-dominated venture capital world makes it hard for women entrepreneurs to get funding. With less than 10% of all partners at VC firms being women today, it’s hardly surprising that less than 9% of all venture capital-funded startups in 2014 were run by women CEOs ( Find out about one of the few women who has broken through in the tech VC world: read Meet the Only Female General Partner at Alphabet’s VC Arm. Better maternity leave policies need to be created that allow women to stay in tech without having to choose between work and family, and to avoid burnout for women who are returning from maternity leave.